Little did I know, when I wrote it, what the impact this one little tweet: “How we handle ourselves in the midst of a miracle matters” would have on me. As the day progressed and many of you tweeted or retweeted it, God began showing me, that My … Your … Our response does indeed matter. 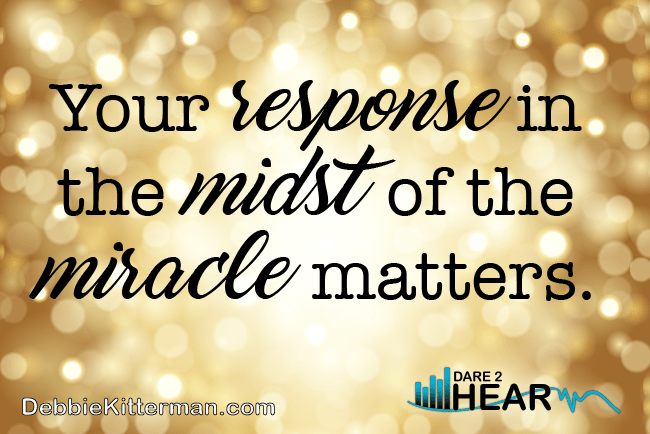 How we handle ourselves in the midst of a #miracle matters. As we read the Christmas Story in Scripture, I think it’s safe to say, that what their expectations were (or might have been) and what their reality turned out to be, was vastly different. Do you ever have expectations that don’t match what your reality turns out to be? I think that we all have expectations that don’t match our reality. 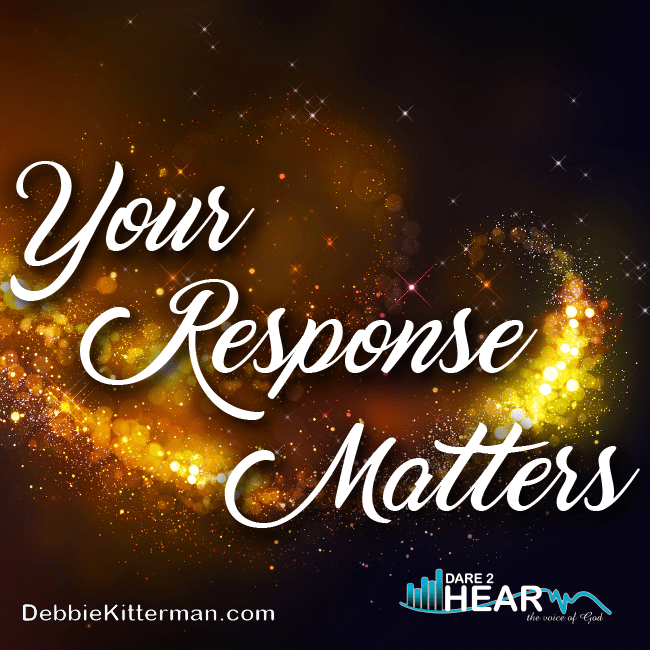 The question we need to ask ourselves is: “How do we handle things when our reality doesn’t match our expectations?” … Because our response does matter. Elizabeth’s response mattered: She believed and yet remained secluded for 5 months to nurture and protect the promise. Mary’s response mattered: She had a pure, innocent heart. She didn’t fully understand but she had faith. Then she surrounded herself with others who would invest and impart to her. In spite of the fact that Joseph seems to be the forgotten man in the Christmas story, he IS central to the whole story of the birth of Jesus. The times when Joseph is mentioned in Scripture he’s doing something important. This reminds me of the television ads in the late 70’s and early 80’s about stock broker EF Hutton. When Joseph is mentioned or responds to something – we need to take notice! I want to talk about things we can learn about Joseph, and we don’t learn them from words spoken by him in the Bible. We learn them from actions he took, and often times, actions Speak louder than words. I believe it’s a significant thing that even as God chose Mary to be the one who would give birth to the Son of God, that it’s also important that God also chose Joseph to be a FATHER to Jesus and to raise Him into manhood. Mary and Joseph were chosen together to be parents. Joseph wasn’t just some afterthought in God’s plan, and neither are we. One reason, I feel God chose Joseph was because of his character. The way he responded in the midst of the Christmas miracle exhibits the man Joseph was. Not just toward Mary, but toward Jesus and others. Let’s look at what the Bible tells us about Joseph. As we read the Christmas Story, in Matthew 1: 18 – 24 & Matthew 2: 13 – 21 there are 5 things we can learn from Joseph on how to respond. Joseph is a man who is looking forward to life with his new wife, looking to start a family, to continue to build his carpentry business, and with the announcement of Mary’s pregnancy, all it all gets put on hold in a big way. Joseph must have felt betrayed, when he heard the news of Mary being pregnant. According to Jewish Law, he would have been expected to publicly divorce Mary. He could have impounded her dowry, divorced her, and had her stoned. However, Scripture tells us Joseph was a good man—a righteous man. He chose a more compassionate path. He had determined to choose a quieter path. It would have been in front of two or three witnesses. He would quietly give her a certificate of divorce and minimize her public dishonor. Joseph is probably the most put-upon person in the Christmas story. The whole situation has scandal written all over it, and many ways Joseph can choose to handle this situation. It’s difficult for us to imagine the depth of Joseph’s shame at this point. In his culture, a fiancée’s unfaithfulness would imply Joseph’s inadequacy, bringing dishonor on him and his entire family. In fact, Jewish, Greek, and Roman law all demanded that a man divorce his wife or break off the engagement if she was unfaithful. Friends and relatives of Joseph would surely have mocked him and treated him with contempt. The divorce would be an embarrassment not only to her, but to both of their families. We don’t see Joseph asking, “Why me, God?” OR “How can this be?” Joseph is the man God chose to be the earthly father of Jesus, and all we know about him is he was a carpenter. However, we know a few other things, too. We know he has royal blood running through his veins. Matthew tells us Joseph’s genealogy runs through King David. We know also that his marriage was arranged. He may not have been the biological father, but he was being charged with bringing up the Son of God. This Joseph, risked all to do what he felt led to do – regardless of the consequences. The result is, that Jesus grew up nurtured in a family, with brothers and sisters, in the synagogue, protected and loved by an adoring mother and stepfather – to fulfill his destiny on earth: to be in the truest sense the Son of God and the Perfect Man. But after he had considered this (Matthew 1:20). Any way we say it, it boils down to the fact that Joseph didn’t react irrationally. He didn’t make rash judgments. He wasn’t impulsive. Joseph was patient. He thought before he acted, and his patience led to an encounter with and an understanding of the will of God. Being patient isn’t something that I am very good at, but it is a fruit of the Spirit and with the help of the Holy Spirit, I am working on it. How many times have we blown it because we failed to be patient? If I’m honest, it’s too many times to count. It’s during these times of learning that it may be painful, but it’s also the times that God works the greatest in our lives and that we can see great growth. Hmmm, this intrigues me, and gives me something to ponder. How about you? I have my thoughts, but I will let you contemplate it for yourself. Joseph was instructed to put aside his fears, believe the angel, and take action. Joseph was instructed to put aside his #fears and take action. Put aside your #fears and take action. I think one of the most important things we can learn from Joseph, was that he obeyed. In fact, as you read Joseph’s story, the phrase: “in a dream” occurs 5 times – 4 of which involved Joseph. Each time, Joseph is given instructions, followed by his response of obedience. The reality is, we each live with a call of God on our lives to follow him and it demands our obedience too. Being in the will of God is often not the most comfortable or convenient place to be, but it is still the best place to be. My response in the midst of the miracle matters. I pray that as you celebrate the birth of our Savior that God would show up in unexpected but wonderful ways for you this holiday season. Membership site, d2htrainging.com is open, I invite you to check it out today, and develop a deeper relationship with the Lord, as you learn to hear Him speak to your heart. Oh, hooray for this post that puts the spotlight on the forgotten man of the Christmas story! Even the second or third shepherd in the Christmas program gets more lines than Joseph! Debbie, I am embarrassed to say I have forgotten Joseph and he is so important. Thank you for pointing out his significance. I will take that forward as I act in obedience. Some of the work I have done and do has been difficult and had very little thankfulness or recognition attached to it. But I am right where God wants me. Thinking about Joseph will help on those days when I am feeling a little worn and needing a pat on the back. Thank you Debbie for sharing these thoughts about Joseph. His willingness to stay in the humble place speaks to me so much. That word, humbleness, keeps coming to me lately, and I want to let the Lord teach me more about that. Blessings to you this Christmas! You are most welcome Bettie. Humbleness is such an important thing for us to understand isn’t it. And Isn’t it just like God to speak to us and then continue to have that message pop up all around us, affirming that which He is speaking and working on in us.. Blessings to you and yours this Christmas as well. You are so right about this Debbie, kudos to Joseph for being faithful to God and Mary. I have seen one painting of him holding baby Jesus and I have one called the Carpenter’s Son. God bless, and Merry Christmas, glad to be a part of your Thursday. Thanks Rebecca – and your paintings sounds wonderful. I love that Jospeh modeled faithfulness to us all. Blessing and Merry Christmas to you and thanks for being a part of the community here. Our responses do make such a difference. Thanks for this encouragement, Debbie. May you have a blessed Christmas! you are most welcome Marilyn. Merry Christmas! Merry Christmas to you too Lisa! This was amazing! I have always respected Joseph for his role in this story. He truly is an unsung hero and an amazing example for us all! Thank you Amy, I appreciate you and your being here. I am so glad you enjoyed this post about Jospeh. I definitely saw him with different eyes this year, and have been guilty of overlooking him in the past. Merry Christmas to you and your family! I have overlooked him for many years as well, but read the story different when I became a step-parent. I love his story! We don’t give Joseph too much thought, do we? He’s mostly mentioned in passing. Thanks for reminding us of the kind of man he must have been. Merry Christmas and lots of blessings in the New Year!